Bullying is a huge issue today, and it’s not getting any better. In fact, it’s reported that approximately 160,000 kids in the USA skip school each day because of the bullying that they’re enduring on a regular basis. Bullying can sometimes lead to extreme outcomes for the victim. Suicide is one, and the rates of this are rising at a disturbing pace. In 2015, the number was the highest it had been in 40 years – it had increased by an alarming 30% in male teens. For the girls of the same age group, it had doubled. Another extreme outcome of bullying is that it can also lead to school shootings, which has happened too often in America. Clearly, something is going really wrong here with how teens feel about themselves, having to resort to suicide because they feel that it’s the only option to deal with being bullied, this is incredibly tragic. People who bully are also in pain themselves, yet the victims often never know this. Social media is also adding to the negative way they feel, and it’s now very easy to bully people aggressively online, so kids can often feel they have no where that they feel safe. School is not safe, and home is not safe. Social media and with all of its airbrushed photos is causing concerning narcissism among pre-teens and teens, and this also contributes to a lack of empathy towards others. These issues aren’t really being addressed at all, and on a personal level, having two young girls who will one day be teens scares the heck out of me. I have a big job on my hands to teach them empathy and that, how we treat others is what is important here, not what we look like. One thing I want to drive home here is, as parents and concerned citizens, we can all do our part by showing kindness and acceptance towards others. We must teach our children this. Wonder is a film that I feel may have the power to really wake people up – bullies included, about how we must not be cruel to others who may look different from the average person and that really, how a person looks shouldn’t matter at all, because how a person is on the inside is what counts the most. Films like this and others that are very powerful at helping others realize bullying is not the answer, I think, should be mandatory to watch in schools. This movie had me crying my eyes out in just the trailer alone! 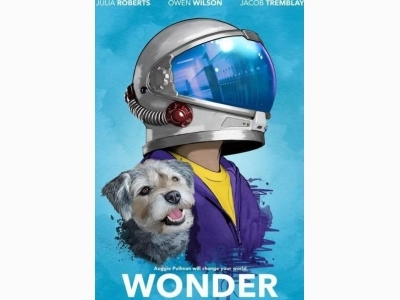 Wonder is about a young boy, Auggie, born with a facial deformity called Treacher Collins Syndrome, starts a new school, suffering bullying, but he is no ordinary kid and shows all around him that beauty isn’t skin deep. #Wonder is a film by Stephen Chbosky, starring Jacob Tremblay, Julia Roberts and Owen Wilson. The script was written by Steve Conrad.